Don't ever start on your hike without a plan. A plan consists of what time you are going to start, what time you are going to arrive at a certain place, what time you plan on starting back and what time you plan on arriving. Always check the weather, even before starting. The weather conditions that might be forecasted the night before, might not be the same conditions that will be in store that morning. Check and recheck the weather as it is for your own safety. Are there weather conditions that usually occur during the day at specific times? When I hike Rocky Mountain National Park, I have to be to be back to timberline by noon time as generally thunderstorms come in around that time and I don't want to be above timberline when thunderstorms occur. The same hike in the summer is quite different from the winter, so plan accordingly. How high are you going to hike? Altitude and steepness of the hike is obviously another factor to consider. Is it a rocky trail or a smooth trail? How many pounds will you be carrying? Is this your first long hike this year or is this your first hike this year? How prepared physically are you for this hike? Factoring in all the above elements will determine the hiking plan and the time needed to complete the hike. Remember, returning is obviously the prime requirement. Be sure your plan covers any factors that you haven't even considered. There are charts available on the Internet based on the average speed of hiking. These charts are only valid if you know how you perform under different conditions. The charts factor in altitude, weather, how many pounds you are carrying, your physical condition, gradient (elevation gain), type of trail and other factors. You should start recording each of your hikes and enter all those factors so that you can create your own chart. After a while, you will have your own precise chart that you can refer to estimate your times. The most important factor in developing your average speed is the gradient of the hike. Gradient = (total elevation gain) / (distance traveled in feet one way). 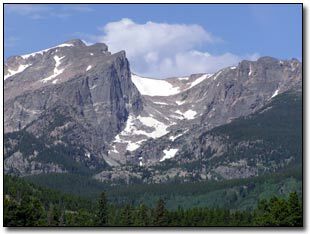 For example, Flattop has a elevation of approximately 3,000 feet and a distance of 4 miles (one way) for a total of 21,200 feet. Gradient = 3000 / 21200. Gradient = .14 Now, let's make the next assumptions as all the hike variables create multiple charts (if you have information that you have already recorded, you can compare the elements of this hike to other hikes): the weather conditions are fine, it is a relatively flat trail, you will just stop for lunch and you are carrying about 12 pounds of gear. Based on these conditions, your average speed should be about 1.7 miles per hour. Total hiking time = total length of hike in miles (8 miles)/average speed in mph (1.7) = 5 hours and 20 minutes. So, If you wanted to hike to the top of Flattop, you need approximately 5 hours and 20 minutes. For this example, you will figure that the time up is equal to the time needed to come down. You expect to stay on top for 30 minutes to eat lunch and capture the views. You also know, based the distance from the top to timberline, you have to allow 1 hour. So, you need a total of 3 hours and 40 minutes to return to timberline if thunderstorms occurred that day. You should also add a little bit of extra time for blisters and other elements that you didn't consider to make a total of 4 hours. So, the latest you could leave (under the best of conditions) is 8:00am. By 12:00 noon, you would be back to timberline and you would have eaten lunch a little early or you could have just watched the views and had lunch at timberline when the thunderstorms occurred. I have been within 15 minutes of one of the summits in Rocky Mountain National Park and I have turned around because it did not fit into my plan. Even though I stuck to my plan, I arrived at timberline 5 minutes too late as thunderstorms had already started. If I had decided to go another 15 minutes, it would have been an extra 30 minutes (15 up and 15 back) and I would have been caught in thunderstorms for about 35 minutes. It would have been a very dangerous situation. Always plan your hike to lower the risk of danger. It doesn't take a lot of time and you will be well prepared.